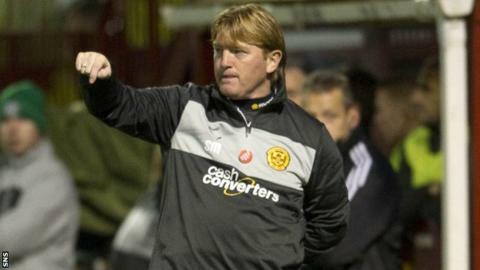 Stuart McCall said "key decisions" against his Motherwell side proved decisive in the 4-0 defeat by Hibs. 'Well were aggrieved that Stevie Hammell's header, that appeared to cross the line, did not count. "Everything that could've gone against us tonight certainly did," McCall said. "I can't believe we've played 90 minutes and not scored with the decent opportunities we've had." Motherwell fell behind to David Wotherspoon's superb strike but thought they had equalised through Hammell's header. However, referee Stevie O'Reilly and his assistant believed Hibs goalkeeper Ben Williams clawed the ball away before it crossed the line. Leigh Griffiths converted penalties either side of Michael Higdon's missed spot-kick for the hosts and Danny Handling netted a fourth for the visitors. "First half, I thought we played well enough and created lots of chances. Obviously, we know now that the ball was a yard-and-a-half over the line," said McCall. "We didn't get it and sometimes games are decided on things like that. In the second half we came out and with the Leigh Griffiths penalty, running away from goal, I haven't seen it again to be honest. "They go 2-0 up and we get a penalty. We miss it and they go up the park and Hammell's challenge is probably a foot outside the box; even if it is a free-kick. "So, everything that could go against us did do. "Key decisions have cost us but also the lack of ability to take chances. We've played some great stuff and put balls across the box and had opportunities. "It was a decent end-to-end game and I can't believe we've played 90 minutes and not scored with the decent opportunities we've had." McCall said he had spoken to referee O'Reilly and his assistants, and that they were "adamant" they were correct on the Hammell incident and the second Hibs penalty. "I don't want to take anything away from Hibs," McCall said. "To come away and score four goals, they'll be delighted. "We've got ourselves to blame but other factors come into it."